William Marsh Rice came from humble beginnings to become an extremely astute merchant and businessman and one of Texas’ richest men. He was determined to follow the example set by his grandfather who lived a long and active life up to 101 years of age. He might have achieved that goal had it not been for two conspirators who ended Rice’s life in order to obtain his fortune. The plot was foiled, however, thanks to an observant banker, and Rice’s fortune was used as he intended – to establish Rice Institute. 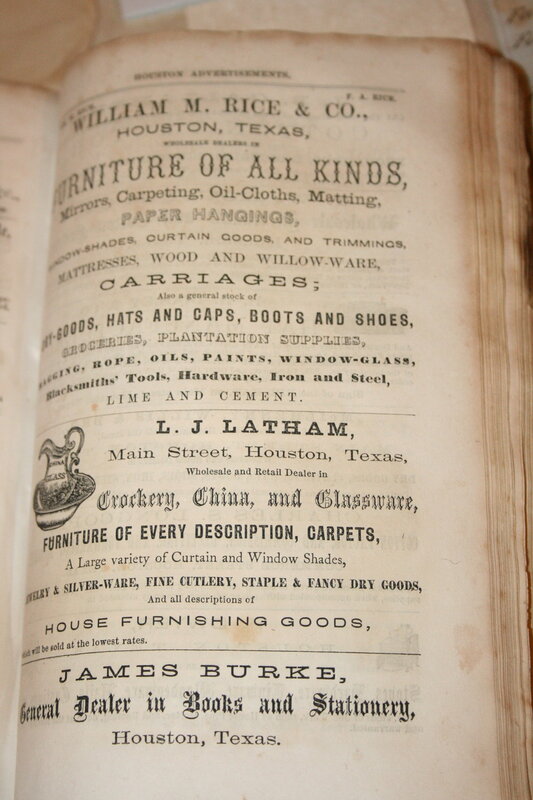 The Texas Almanac of 1859 with an advertisement fro William M. Rice & Co. Courtesy of Woodson Research Center, Rice University. William Marsh Rice was born on March 14, 1816 to David and Patty Hall Rice in Springfield, Massachusetts. He was named William Marsh after the clergyman who organized his family’s church. Lured by unlimited potential for business, Rice traveled to Texas in 1838. He bought 320 acres of land in the town of Houston and opened a general store on the east side of Main Street between Congress and Franklin Avenues. Over a period of years Rice became one of the most important commission merchants and cotton factors in all of Texas. Cotton came to his warehouse from as far away as Dallas, and in turn those cotton growers bought the manufactured goods that Rice stocked in his store. Because banks were illegal and nonexistent in Houston, Rice was also able to provide all manner of banking services, except the issuance of currency. By April 1865, he was worth over $1 million, due in large part to the fact that he was able to continue to operate his business out of Mexico during the Civil War. Just a few years later, the endowment was in jeopardy. In June 1896, just before Rice’s second wife Elizabeth died, Orren T. Holt drew a new will for her which deemed her a resident of Harris County, and under Texas community property law, allowed her to dispose of one-half of Rice’s assets acquired during their marriage. Holt and several of Elizabeth’s family members benefited greatly from this new dubious will. The will, kept a secret from William, was admitted to probate in Harris County court in March 1897. Soon after, Rice filed suit against Holt in which he claimed to be a resident of the state of New York, devoid of community property laws. Lawyer Albert T. Patrick was hired by Holt to take testimony in the case of Rice v. Holt and thus became acquainted with Rice’s large bequest to his Institute. Patrick fabricated a new will naming himself as residual heir instead of the institute, and with the help of Rice’s valet, Charlie Jones, obtained witnesses and a notary. In order for the men to profit, Rice needed to die. In the late spring and early summer of 1900, Patrick provided Jones with mercury pills for Rice, but they produced minimal effects. On September 8, 1900, the Galveston hurricane severely damaged Rice’s properties and on September 16 his cottonseed mill burned. Rice agreed to use the entire balance of his checking account—$250,000—to repair his properties. By that point, Rice’s fate was sealed. Patrick instructed Jones to use chloroform on Rice and a doctor certified Rice’s death on September 23 from natural causes. An alert bank clerk noticed the next day that a large check, actually forged by Jones, had misspelled the recipient’s name - Albert T. Patrick. A telephone call for verification revealed that Rice died the evening before and bank officials telegraphed Rice’s attorney in Houston, James Baker. Jones was arrested and confessed to his part in Rice’s death and implicated Patrick who was then indicted for murder and forgery. Although he had no direct heirs, William Marsh Rice’s legacy lives on though the University that he established in the city where he built his fortune. The lawsuit and countersuit regarding Rice’s estate lasted until February 1902. The cornerstone for the Administration Building (Lovett Hall) was laid on March 2, 1911. Exactly ten years after the murder, on September 23, 1912, Rice Institute opened its doors to its first class of students. Banner image: The Administration Building (Lovett Hall) 1912. Courtesy of Woodson Research Center, Rice University.